Today was my first day on the "Nush" for the season, there are a decent number of Kings being caught but a good number of them are jacks. The fishing was red hot for the guys we had there last week but the tides are smaller right now so there should be another good surge of kings on the next big tide. Steve and I pictured with a good one from today taken down trolling spinners. More King pics to come this week, King Salmon to be released cannot be removed from the water so other than the occasional in the net shot the only ones you get to see are the ones we keep. 6/25/2011 Steve with a good Nushagak King Salmon. 6/25/2011 One of the smaller "jacks" we let go. Today was the first day of guiding here at Mission Lodge and my assignment was fishing a remote stream for Arctic Char. Fly fishing for Char in the early season is a blast, setting up at a river mouth or outlet to a river from a lake where sockeye salmon smolt are making their way to the waters of Bristol bay. The Char use these areas as ambush points to feed on the down migrating smolt and it's quite fun to watch as char crash the surface from below and Arctic Terns dive bomb from above, then when a fly imitating the smolt lands in the mix it's game on!! Sam and Chase are pictured below with a couple nice Char from today. 6/18/2011 This fish had Sam into his backing before I could pull the anchor!! 6/18/2011 Char are devouring Sockeye smolt right now. Well this is the last post on Michigan fishing until mid-September as I leave early monday morning for Dillingham, Alaska where I will find my home for the next 3 months at Mission Lodge. As many of you know I look forward to my time in Alaska every year and by the time it is over I am looking forward to getting back to Michigan for King Salmon and Steelhead just as much. Look back here for updates on what is happening in Alaska periodically throughout the summer, just not as regularly as while I am home. I am reachable by e-mail and check my voicemail messages regularly for those of you looking to book fall Salmon or Steelhead dates, although e-mail is the best option with the 4 hour time difference and a busy guide schedule in Alaska. I fished with David, Kirk and Ryder the last couple days on the Muskegon and Pere Marquette River. We fished the Muskegon last evening and found plenty of Brown and Rainbow Trout and a few Smallmouth Bass willing to eat just about anything we threw at them including spinners, rapalas and dry flies. The Pere Marquette River did not produce the numbers of fish the Muskegon did but the quality was better. When we pulled into the boat ramp I noticed the river was up a bit with some color so we decided rapalas and spinners would be our best bet, we had a handfull of nice fish in the mid to high teens chase to the boat and enough low teeners that actually commited to keep it interesting. Ryder is pictured below with a couple nice Brown Trout from the Pere Marquette River today. 6/11/2011 Ryder with a nice Pere Marquette River Brown Trout. Each summer before I head to Alaska to guide for 3 months Ed and I like to head north to a fairly well known "little river" in search of the run of early kings it holds. While there may not be big numbers of these chrome beasts, for the motivated angler there is enough fun to be had. We found fish coming in this morning chasing bait, what fun to watch!! 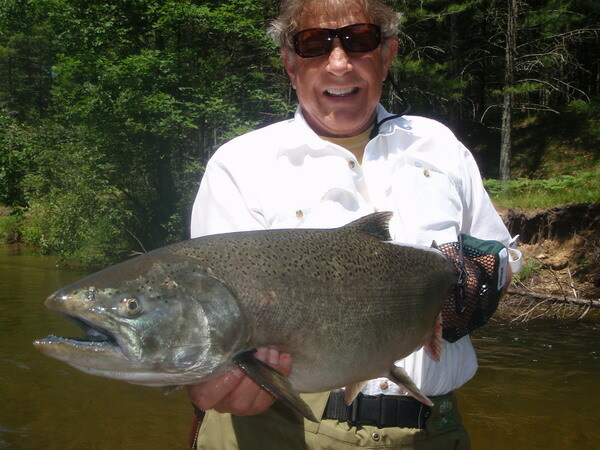 When you do hook, (or should I say encounter), one of these early King Salmon in tight quarters the chances it will come to hand for a picture are very slim, Ed made it happen today with the great fish pictured below, nice job Ed I am looking forward to casting Thundersticks for Salmon when I return in September. 6/8/2011 Ed with a very hard fighting little river Salmon.